Dreams of a Pocket Park facelift in the heart of Uptown Pitman will soon become a reality thanks to a THRIVE SJ Grant that was presented to the Chamber of Commerce last evening by Laura Wallick from New Jersey Community Capital. 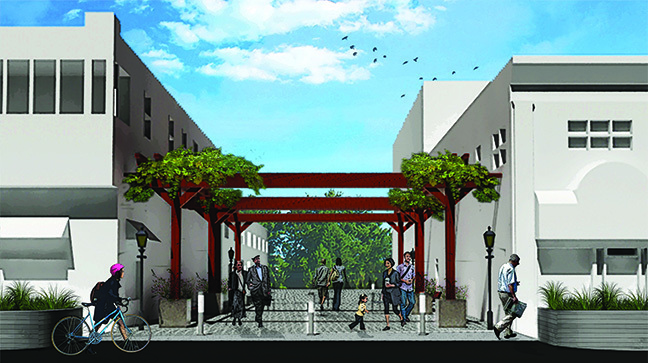 The $15,000 grant will go towards the conversion of Theatre Avenue to Theatre Plaza, a new public space in the center of the downtown. Pictured, left to right, Lisa Morgey, Pitman Chamber of Commerce president; Laura Wallick, NJ Community Capital; Yvonne Giovannitti, The Inn on Holly B&B; Councilman Jim Pierpont; John Fitzpatrick, Chamber VP; Mayor Russ Johnson; Councilman Michael Razze; Councilwoman Amy Rudley, Dan Shriver, EDC. Through the fundraising efforts of the Greater Pitman Chamber of Commerce, this new space with shoppers strolling and sitting among canopy lights, bistro tables, beautiful planters, and weekend music and art is finally coming to fruition. 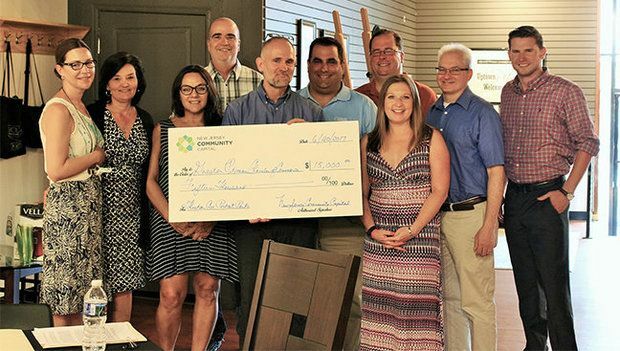 Laura Wallick from New Jersey Community Capital presented the Grant award during the Greater Pitman Chamber of Commerce’s general meeting on June 20. The meetings are held at the Pitman Gallery & Art Center, located at 53 N. Broadway, Pitman. The grant was received by members of the chamber and the economic development committee, with Mayor Russ Johnson and several members of council in attendance. This grant is awarded to towns to help support targeted projects or activities that help enhance the impact of community based organizations in achieving their community development missions. This is a very special honor for Pitman. Fundraising began in January 2015 with an initial donation of $10,000 from the Greater Pitman Chamber of Commerce. The last fundraiser was held during “The Broadway Theatre Celebrates 90 Years on Broadway.” Use of the Broadway Theatre was donated by Peter Slack, president of The Broadway Theatre. So far, the combined efforts of Pitman’s organizations, individuals and government have raised over $53,000. A final donation will be made by the Chamber of Commerce. The $15,000 grant will go towards the conversion of Theatre Avenue to Theatre Plaza, a new public space in the center of the downtown Pitman. Pitman, located just minutes east off Route 55, just west of Rowan University, and 20 minutes from Philadelphia, is a unique town with a vibrant business district and an ongoing calendar of music, arts and other well-known events that draw visitors from a large area. This item submitted by Joan Stoltzfus for Greater Pitman Chamber of Commerce.